Wishing you all a very Happy Sankranti. 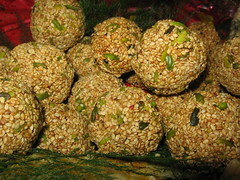 Received some delicious “tilgur ladoos” for this special occasion. I remember as kids we did a lot of kite flying during this season. We used to cut our fingers with the manja, buy lots of manja months in advance and spend sometime rubbing finely broken glass over it so that it would be sharpest and cut other kites in the sky on this day. This year is not going to be anything special, it’s going to be just an ordinary day at work with lots of sweet ladoos being exchanged and yes my team is also conducting the “Screwdriver” session at office. It’s going to be an exciting Saturday evening. More updates after the event. happy sankranti to you too..